Village News – August 1, 2018: Mikaela Lawrence, 23 spent six years as a hairdresser wanting to get into the mechanical industry. 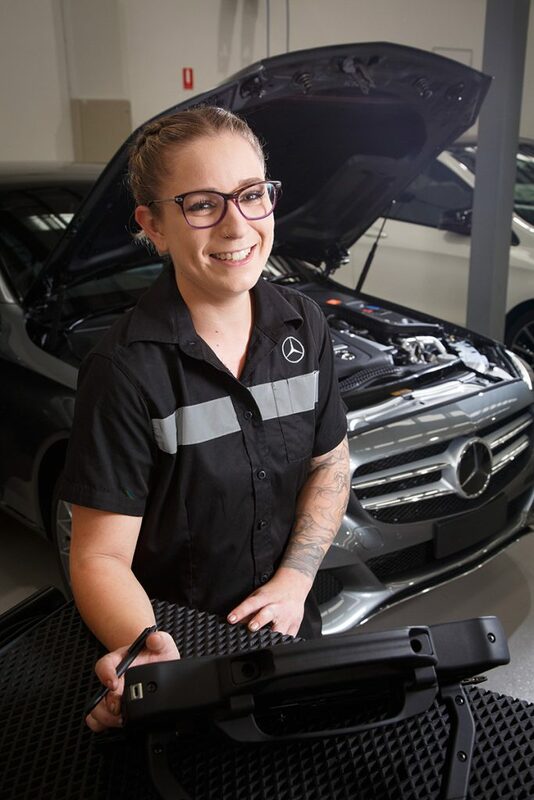 Now in just the second year of her automotive apprenticeship at Fortitude Valley’s Mercedes-Benz Brisbane, Ms Lawrence has been awarded the Kim. T. Wyman North American Scholarship for Skills Excellence by not-for-profit group training organisation WPC Group. “I did a hairdressing apprenticeship and kept trying to get into mechanics, sending out hundreds of resumes,” Ms Lawrence explains, saying hairdressing was “a back-up I did for six years”. An entry-level automotive course at TAFE Queensland greatly increased Ms Lawrence’s chances of securing an apprenticeship through WPG Group, who then placed her with Mercedes-Benz Brisbane. “Right now, I’m very happy with working on light vehicles and who knows where life takes you?” she says. The scholarship, awarded since 2016 and commencing in September this year, is a cultural and career development program which educates apprentices in how Mercedes-Benz America applies their skills and expertise in automotive. 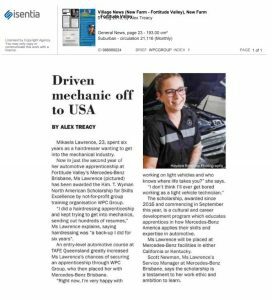 Ms Lawrence will be placed at Mercedes-Benz facilities in either California or Kentucky, Scott Newman, Ms Lawrence’s Service Manager at Mercedes-Benz Brisbane, says the scholarship is a testament to her work ethic and ambition to learn.